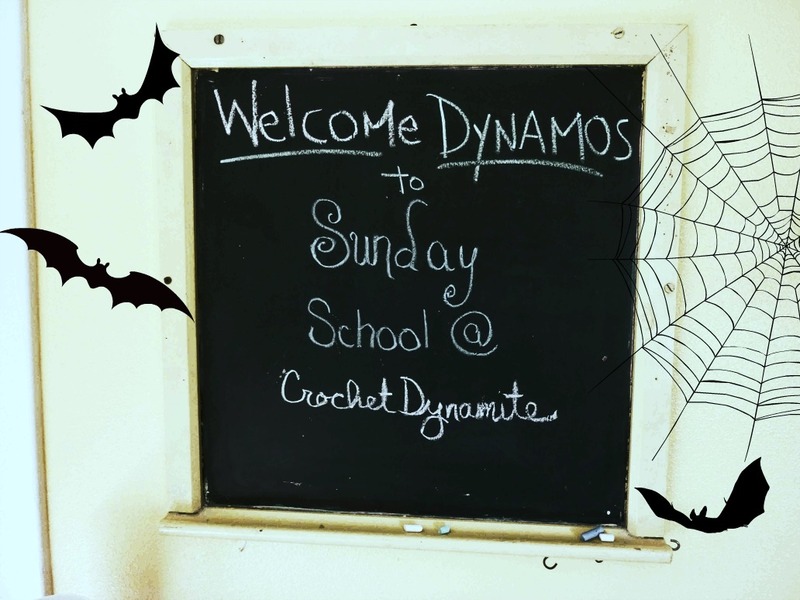 Welcome to the Halloween Round-Up edition of Sunday School! It's a collection of the most fun Halloween projects that I've found this month - and a completely awesome music video featuring some really cool crochet! There are two amazing projects over at GoodKnits.com, a bat bowtie (which would make an awesome decoration for a headband too) and a cool superhero mask... It may be called Good Knits, but the crochet over there is awesome too! Crochet Happy, my friend Tracy's amazing site, has a terrific collection of Halloween project links. Some of them are paid, but most of them are free! There are home decor projects, hats, shawls, and amigurumi! It's a party going on over there!! Click HERE to join the fun! My friend Teeni, over at the Mad Crochet Lab, has several spooky Halloween projects! She's got a really adorable 'evil pumpkin' finger puppet and a really scary-fun skull pattern. Both of her patterns are available for sale in her Craftsy shop, but I'm going to send you to her blog, because I know you'll love it! Woolly Toons has a project that isn't specifically for Halloween, but since it involves a character from my very most favorite Halloween-time movie, I had to link to it! It's the Shrunken Head Guy from Beetlejuice! I'm in awe of this one! Kim is amazing! My friend Nyan-pon has more costume ideas on her site than anyone else I know (she's got a whole page on her site, NyanPon's Knits and Crochet, devoted to costumes!)! She's kinda really awesome that way! Go over there and check out her ears and tails for pretty much every animal that has ears and tails! And Ninja swag! And a crochet wig! Go there now!!! Once you watch it, I'd love to hear what you think of the video in the comments below! Oh, and I almost cried when I saw that video the first time. It is so well done though. I know, right? It took me almost 10 minutes to calm Mims down... D: But it was just too cool, I had to share! Oh my gosh I must, must, must have this thing by Christmas! Or I will throw a fit like that girl Veruka Salt from the Willie Wonka movie... seriously. that is a cool video. I thought so too! I was all, "why haven't I seen this before??" so I had to spread the quadropus love! Oh, I loved that video. It was amazing how fluid the motion was. So beautiful and so sad. I have to admit, at the end I did think to myself, "I can fix that." I would really love to make the Quadropus now, just so I could give him a big hug. I'm so glad you popped by! I found you via Teeni's great interview with you over at MadCrochetLab.com (gotta give Teeni her props!)! I'm so glad I popped by too! You have such a great blog. And I found you the same way :) Teeni's awesome. I loved the interview swap you guys did. Whether your priority is variety or taste, VaporFi is will fill your vaping needs.